Before Thursday night I would have told you there was bound to be nothing exciting about watching four catsuit-clad pensioners sway gently behind their laptops. I mean, sure, music was playing, but for all we know they could have been messaging dirty jokes to each other or doing their grocery shopping online up there. I didn't really care, in the end. 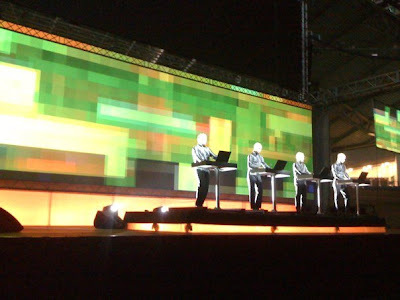 Because the whole spectacle, the show Kraftwerk put on to launch the 2009 Manchester International Festival was completely absorbing. There was something monumentally right about seeing Kraftwerk at the Manchester Velodrome - not just because of Ralf Hütter's well-known cycling obsession but for the shape of the place, the long slow curve of the banked track hugging the audience like some giant gear casing. It's a tough one as a music venue; Opener Steve Reich's piece seemed sadly diminished in the giant space. But it was just right for the main event. The sound was great, and you couldn't beat the view. From my perch up on the battlements, the scene resembled some weird postmodern rally, like a scene out of Metropolis, the crowd sparkling with the blue lights of a thousand mobiles recording. They went wild when Kraftwerk came on with Man Machine, four streamlined figures outlined with elegant brutalism against a giant screen flashing up propaganda-poster style text. And they totally lost it when cyclists from Team GB took to the track during Tour De France. There were hiccups. The event started late, probably because it took everyone longer to get up to the Velodrome than they thought, which is, like, really far from the city centre (and next to what someone told me is the biggest Asda in Europe on the walk to the bus stop.) They ran out of 3-D glasses at some entry points whilst others had extra. And then there was the heat. Sweaty doesn't even begin to describe it. Everyone's 3-D glasses were fogging up. The best bit for me came during the 3-D section, when the launched into Radioactivity, the stark menace of the names Chernobyl, Harrisburg, Sellafield, Hiroshima flashing up on the screen, that voice instructing us with the cold precision of roentgens to STOP RADIOACTIVITY. This was the Cold War-era vision of the future as certain nuclear apocalypse. It made me almost nostalgic for the time when I went to bed at night and listened nervously to the drone of planes overhead. So maybe we don't travel by hovertrain or have cyborgs running the country (yet! though there are a few I have my doubts about), but musically, at least, their vision of the future was a self-fulfilling prophecy. Their songs don't sound cutting-edge to us anymore simply because Kraftwerk was so influential. Even leaving aside the warring tribes of Electronica who owe their very existence to these guys, Kraftwerk's haunting melodies have turned up in some pretty unlikely places. You have to wonder how many people heard Computer Love last night and went, "wait a minute... that Coldplay song." Whoever did the visuals earned every bit of their fee. The much-anticipated 3-D section surpassed the hype, with numbers and drug capsules and radioactive symbols bouncing off the screen at you with spooky immediacy, even from as far back as I was. I devoutly hope nobody there was foolish enough to have taken hallucinogenics; none were needed. Just being there was more than enough to bend your brains.